The Queen room of Ovolo 1888 is emblazoned with a bold mural. Sydney, NSW. A night in Ovolo 1888, on the grittier side of Darling Harbour, with its casino and industrial past, is a night well spent. I’m all for fun touches, but when I have to hang a sign on my door that advertises that I’m in the process of ‘Gettin’ busy’, I wonder if it’s all gone too far. Too embarrassed to hang the quirky take on the ‘Do not disturb’ sign, I live in fear of housekeeping walking in at any time. Cringeworthy signs aside, Ovolo 1888 in Sydney’s Pyrmont, is a triumph of restoration, its 90 rooms occupying a towering brick 19th-century wool store. Where perhaps pulleys once hauled pallets of wool up into the cavernous atrium, now a sleek glass lift rises up through the hotel above the foyer, bar and lounge. It’s a striking first impression, with exposed brick and reclaimed timber coupled with contemporary pine furnishings creating a wonderful industrial-chic space. The 19th-century brick exterior of the Ovolo 1888 in Pyrmont, NSW. Alas, we’ve arrived just after the early evening complimentary happy hour in the foyer’s Lo Lounge bar and so ask the receptionist where we should head out for the evening. Having just dodged packs of screaming teens on the boardwalks of Darling Harbour, we don’t fancy venturing back that way. The receptionist’s suggestion: Sokyo at The Star Casino, a 10-minute walk up the road. 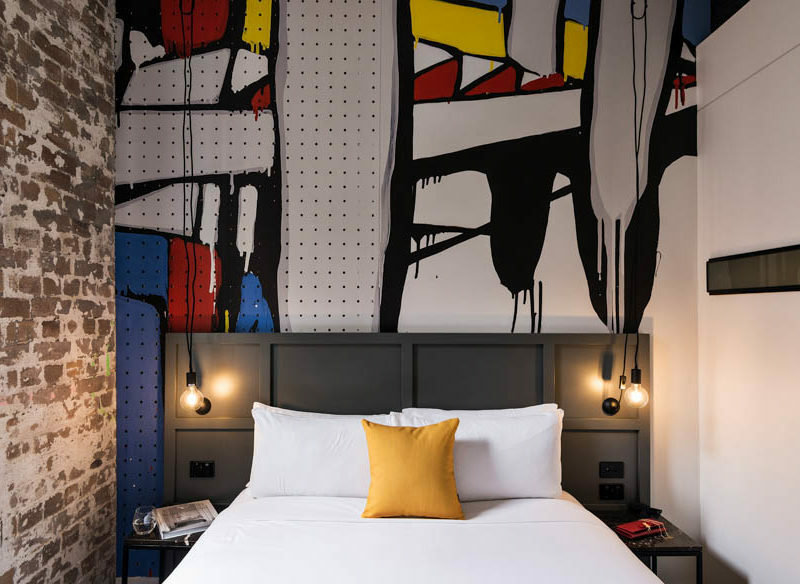 Upstairs our Queen room has a lovely, time-worn hunk of ironbark that stretches above recycled timber desks, which contrasts with bold splashes of primary colour in an abstract mural behind the bed and a wall of exposed brick. The bathroom is a simple affair of dark stone cladding, white tiles and modern fittings. Under the rain shower I have time to notice the fiddly details that would’ve had workmen cursing as they installed them with their trowels, such as the sliver of frosted glass allowing light to penetrate from the bedroom. We’re only here for one night so we don’t get to utilise the Apple TV, iPad, and, reluctantly, the complimentary snack bag and mini bar with beers and wines. “Don’t worry, I’m sure there’ll be a restaurant-of-the-moment serving farm-to-fork, pond-to-plate stuff somewhere around here,” I say to my wife, dubious that she’ll want to go to The Star to dine at Sokyo. But to my surprise she insists on trying the hatted restaurant, where we share an array of finely crafted sushi rolls and a wagyu sashimi. After a failed attempt to persuade my wife to play blackjack, we head back to Ovolo 1888 where I realise the hotel has dissolved my inhibitions and I’m able to hang that risqué sign on the door after all. The Lo Lounge of the Ovolo 1888 in Sydney, it is a brilliant shared space in the cavernous atrium. A lovingly designed property in the heart of the city (albeit not the best ventricle), this is a comfy, fun hotel minutes from Darling Harbour. The building’s historic character delivers a wonderful industrial-chic feel in keeping with this corner of Sydney. Despite it being a Friday night, we felt the room rate of $409 was too pricey. Our rate included one night in a Queen room, a cooked breakfast, mini bar and happy hour, but they’re extras you may not necessarily indulge in.